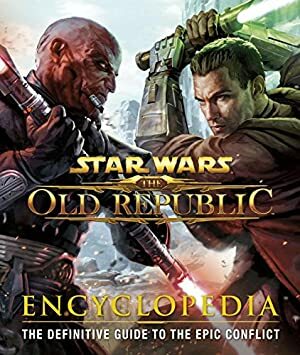 The Old Republic is one of the Bioware Star Wars computer RPGs, this one with a not-so-successful MMO format. It is part of the Extended Universe, which is no longer considered canon since 2014. Its strength is to offer eight distinctive story tracks (one per character class). Here is a version of the Imperial Agent “track”, covering the first 15-ish levels before class specialization kicks in. As such there are S P O I L E R S for Hutta and Dromund Kaas. Since this is a RPG, Iris is but one possible version of the Imperial Agent, who is extensively customisable. As often when we present “sample” video game Player Characters, the profile includes additional sections about the game universe. This profile features a sample or customized Player Character. See our video games writeups FAQ for more. Real Name: Agent Iris Kalder. Other Aliases: The Red Blade (stolen identity from the actual infamous pirate) and various other covers. Group Affiliation: Imperial Intelligence Services. Height: 5’6” Weight: 125 lbs. Eyes: Amber Hair: Grey-white (dyed dirty blonde). She’s also been a skilled hacker ever since she was a teenager. Kalder is highly intelligent. She also can be unusually meticulous and details-minded when it is appropriate to the operation at hand. She absorbs and processes information in a remarkably fast and efficient way. That makes her an exceptional potential as a special agent. As an Imperial agent, she is backed by a vast web of contacts, analysts, technical experts, mercenaries, etc.. Imperial Intelligence is a remarkably competent and well-funded agency. Iris’ primary weapon is a modified blaster carbine with a custom shoulder stock, compact holosight with optional x2 magnification, a laser sight and a match barrel. This is optimized for short-range sniping. She also carries a blaster pistol, but this is chiefly a backup weapon. Though it gets used when a fast draw is critical. A launcher on her right forearm silently shooting corrosive, toxic darts. Mini-grenades (both concussives and flash-bangs). A cover shield. This is a trio of force shield generators that are dropped to the ground and erect protective planes. These are too weak to take blaster fire, but they are normally used to reinforce existing, physical cover rather than just dropped there on their own. This allows said cover to better withstand enemy fire, forming a better sniper nest. Iris can pick them up and reuse them as needed. Ms. Kalder’s “homeworld” is a largely sterile environment lit by a special sort of cold light. If it weren’t, many of the compounds found in the asteroid belt worked by the miners would ravage the facility via disease, explosions, fires, etc.. A lot of it is fiercely bioactive and/or chemically unstable, even in tiny quantities. As a result she is unusually sensitive to bright light and strong smells. When relaxing she will often wears a special mask with a tuned anti-glare visor and air filters. Like many Bioware Star Wars role-playing games, SW:TOR takes place thousands of years before the events in the original film trilogy. See our Republic Trooper profile for more. 2I is the main intelligence service of the Empire during the Old Republic era. Its days of glory came during the Cold War. Which is the era after the Sith Empire attempted its comeback and waged war against the Galactic Republic, with excellent but not sufficiently decisive results. The Empire heavily invested in its intelligence services. This turned their spooks into a lethal weapon far surpassing Republic intelligence and counter-intelligence operations. Imperial Intelligence is daring, fast, smart, highly trained and wealthy. Empire spies are everywhere among the Republic and beyond. These provide an invaluable edge in intelligence gathering, intelligence analysis, political manipulation and covert action. Their sole failure was infiltrating their Republic counterparts, which could never be carried out to a significant degree. “Watchers” are undercover agents. They do not act on their own outside of their routine surveillance work, but will activate to support other agents in the field. They are the bulk of the personnel. The case officers are the spymasters coordinating agents in the field and issuing orders. They use the callsign “Keeper”. The elite field agents tasked with action ranging from negotiation to manipulation, and from assassination to infiltration, use the callsign “Cipher”. Becoming a Cipher is Iris’ burning ambition. But for now she is an Agent – the less senior version. Expert analysts use the callsign “Minder”. They often double as counter-intelligence and process optimisation experts. Some of them are genetically enhanced for high intellect. Imperial Intelligence also employs many specialists, ranging from poison experts to historians, to brief and equip Keepers, Agents and Ciphers. They use the callsign Fixer when necessary. Imperial Intelligence also pays innumerable mercenaries and informers. And it pays them well. Two of the biggest successes of Imperial Intelligence during the Cold War were not operations conducted against the Republic. Rather, they convinced two powerful un-aligned groups to support the Empire during the Cold War. The first were the Mandalorians. These are a warrior culture open to persons from all species and all planets… as long as they can cut it. Mandalorians revere strength and combat prowess. Their vaguely Nietzschean ethos is all about meeting other great warriors in combat to become stronger. Back then and for centuries before and after, the Mandalorians were major players. They were numerous, experienced and very well-armed. Having the Mandalorians clearly side with the Empire was achieved by picking a physically gifted but none too bright Mandalorian gladiator. Imperial Intelligence arranged for his further training. Furthermore, they worked tirelessly to pave his way toward success, often by subtly poisoning his arena opponents. The gladiator achieved such an unbroken string of victories that the rest of the culture declared him to be the new Mandalore. That meant he became a sort of exemplar/general/cult leader for Mandalorians. This Mandalore was deposed surprisingly quickly by a much brighter leader. One of the first acts of this new Mandalore was to exterminate Mandalorians who were pressuring for an alliance with the Galactic Republic. Therefore, his rise to power likely owed a lot to Imperial Intelligence. The Empire now needed a capable general for their Mandalorian allies, and they made him. (For more about Mandalorians, see our second Nekev Nisrok profile). The second were the Hutts. This is the species of Jabba in Return of the Jedi. The members of this alien species tend to be ruthless, amoral, highly intelligent, paranoid and megalomaniac. This in turn make them exceptionally good at developing and running criminal organizations. A large chunk of organized and not-so-organized crime in the galaxy sees some involvement from prodigiously rich and influential Hutt crime lords. Always careful and hedging their bets, the Hutts were highly reluctant about picking a side during the Cold War. Both the Galactic Republic and the Empire vied to have them forego their neutrality. But Imperial Intelligence emerged the clear victor. One such action was conducted by a young but very promising agent – Iris Kalder. Iris comes from the asteroid mining facility DMP-87-3002, aka “The Dump”. For centuries, this semi-mobile base has been breaking down and processing ore in an otherwise uninhabited system. Iris’ family have been miners in the Dump for at least six generations. This is obvious in her skin tone and hair colour. She tired of the ghastly mining life before she was even 12, and decided to find a way out. She opted to study to become an ore barge pilot. These were the only people she could see from the world outside the mining facility. However, miners were kept perennially in debt. Iris was gifted, and likely capable of obtaining a piloting licence purely via downloaded classes and flight sims. Yet her family couldn’t afford them. Determined to make money but aware that it was legally impossible, Iris taught herself computer security throughout her teens. There again, the world of the mining facility was too closed and too controlled to allow direct results. Even keeping pirated barge piloting simulations was too risky. All data storage went through deep packet inspections. As a consequence, by age 16 she was studying the tax code and insurance contracts. Albeit this was rather unexciting, Iris finally found an angle. The mining company was earning insurance payments when miners were accidentally killed. Said payments were technically for the families, but were pocketed by the bosses. Said payments also opened rights to tax returns, based on how early the death had taken place. The effects were primarily about the taxation of inheritances. However, since the miners never earned the insurance payment, they couldn’t possibly obtain that return. And anyway they wouldn’t know that it existed. Young Iris set up a cunning, nearly victimless scam. She used forged HR data to replicate insurance policy numbers and have the tax return payments directed onto phony off-facility accounts. From there they were anonymised, and recollected. Over two years she obtained more than enough money to buy full, registered freight barge piloting classes. While she studied those, she continued to run her scam so she could pay off her parents’ debts. Though her grift was both meticulous and cunning, she lacked real-world experience. Thus, Kalder was spotted by anomalous pattern probes from the Imperial Revenue Service fiscal data mining operations. When she filed her reports about the scam, the IRS analyst ticked the box asking whether the hack was particularly cunning. She did not suspect how fateful that little mark was. This forwarded the report to the Imperial Intelligence services, always on the lookout for crafty hackers to press into service. They agreed that the setup was fairly good. They then revised their assessment to “very good” once they learned that the hacker was two months shy of her 17th birthday. That led to a recruitment green light. A pair of shock troopers led by a Sith apprentice came to the mining facility. They arrested Iris and killed her parents. Officially, Iris was shipped away as a slave at a prison camp. The Sith apprentice was the one who cruelly slew the couple of miners, to “eliminate loose ends”. Apparently, this apprentice was only present because her master wanted her out of her hair for a bit. The Darth had assigned her apprentice to a random Imperial Intelligence errand in lieu of an agent. This is one of the Dark Council’s prerogatives. 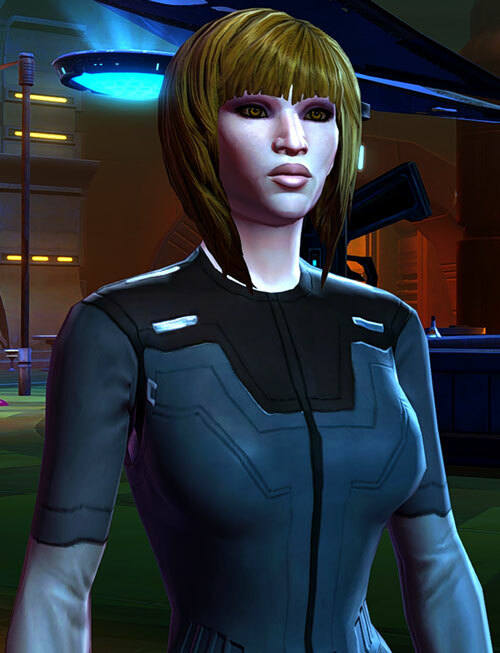 Iris Kalder was trained and conditioned for years by the ever-efficient Imperial Intelligence taskmasters. They took her existing capabilities to new levels, and refined her potential. Most technically-oriented recruits become Fixers (technical experts). But Kalder was deemed suitable for field ops. She was even considered a future Cipher agent if she survived long enough. By age 22, Kalder was deployed for her first big, high-stakes operation. Imperial Intelligence was looking for ways to have the major Hutt crime lords side with the Empire against the Republic. This would be a major victory given the vast power of Hutt criminal networks. Iris was to find a way to convince a Hutt named Nem’ro to firmly side with the Empire. A local contact had arranged for her to hijack the identity of the Red Blade. The Blade was an infamous space pirate currently far away from Hutta – and whose appearance was a mystery to most. Impersonating the Red Blade, Iris favourably impressed the Hutt. Then she started looking for a handhold to twist the crimelord toward the Empire. Early on, her Keeper worked out that backing Karrels Javis, one of Nem’ro’s lieutenants, was the best bet. Though naturally inclined toward the Empire, the man’s star’s with his boss was fading. Keeper wanted to employ a typical Imperial Intelligence stratagem. Iris would work in the shadows to ensure great success for him. Javis would become favourite again, then influence Nem’ro to side with the Empire. Agent Kalder competently ran a number of operations against Nem’ro main competitor. This did put Karrels Javis back in the saddle. However, Javis’ sons were coincidentally attacked by a Sith apprentice. This soured him against the Empire. Plan A was thus ruined, and Keeper activated plan B. Iris now was to fake an alliance between Nem’ro’s most hated rival and the Republic. Since Iris had already made plenty of headway in handling the local crime scene, the switch went well. Fake Republic equipment was successfully planted, and Nem’ro was successfully manipulated. Iris even ensured that Nem’ro could devastate his rival’s holdings. He would thus gain additional resources to back the Empire with. As the operation gained steam, Iris took some hidden initiatives. Her goal was to serve the Empire while sticking it to the Sith. The big one was secretly letting Karrels Javis go, after ensuring that his beef was with the Dark Council rather than the Empire as a whole. After all, the senseless attack on his sons was much like the gratuitous murder of Iris’ parents. On Hutta, Iris also retained muscle on a long-term basis. Nem’ro’s chief enforcer at that point a Rattataki called Kaliyo Djannis. Kaliyo was a redoubtable mercenary known for both her combat skills and her sociopathic behaviour. Djannis was now bored with working for a Hutt. And she could smell right away that “the Red Blade” represented an exciting opportunity. (For more about the Rattataki species, see our first Nekev Nisrok profile). Keeper agreed to put the Rattataki on IIS’ mercenary payroll, and to pair her up with Kalder. Though Djannis was a militant anarchist and despised the regimented Empire, she knew that Imperial Intelligence was a pragmatic, competent and moneyed lot. Thus, she took the deal. Kaliyo also overconfidently assumed that she could manipulate Iris. She clearly underestimated the skills of IIS agents in this domain. After a violent encounter with the real Red Blade, Iris Kalder hurriedly left Hutta. 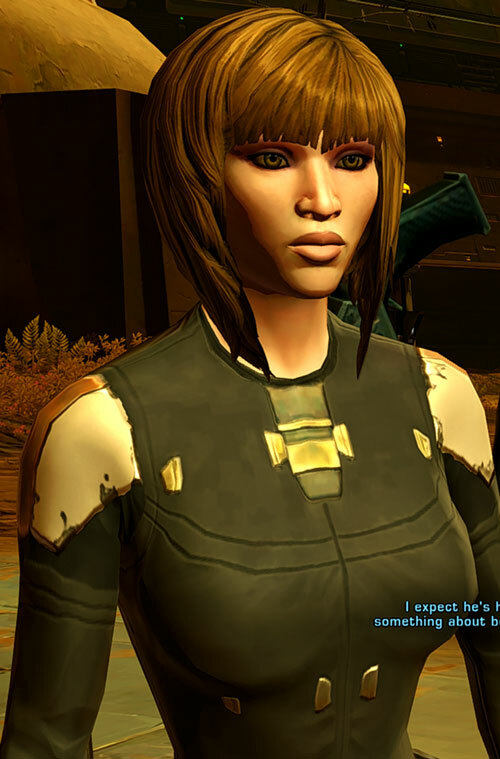 She was to return to Dromund Kaas for debriefing and a new detail. She boarded a military transport ship, the Black Talon, to gain time. During the flight, the Talon was ordered by Grand Moff Kilran to change its route to attack a Republic warship carrying a VIP. The commander of the Black Talon refused to attack a warship with a transport ship. Incensed, Kilran had an infiltrator droid aboard the Talon scan the passenger list, then contact Iris. 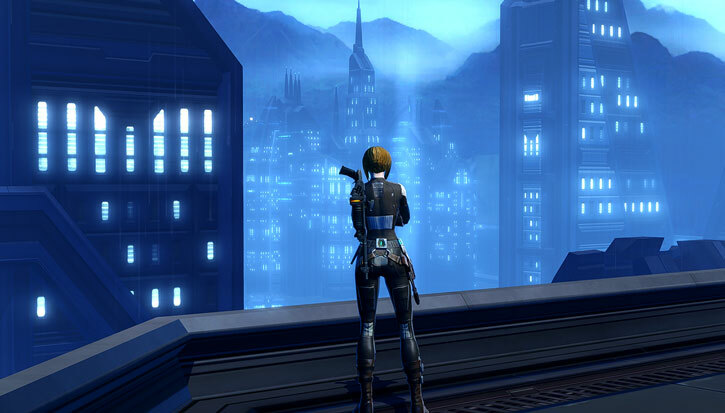 The Dromund Kaas skyline. Click for a larger version. Kilran wanted the IIS agent to take over the Black Talon and “convince” the Captain to follow his orders. 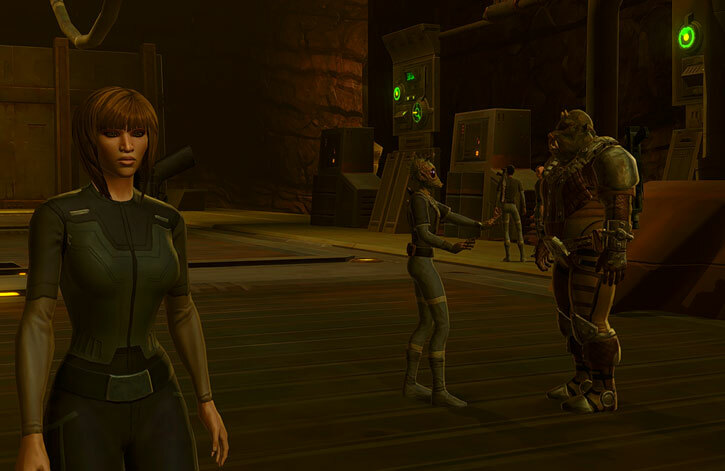 Having noticed that there was — improbably enough — another Rattataki mercenary on the Talon, Kalder and Djannis hired one Nekev Nisrok and her sidekick Mako as additional muscle for this op. The quartet took over the Black Talon, forcing it to attack. After repelling Republic boarders, they boarded in turn. The incredible strike was successful. They overcame all resistance, grabbed the target alive, and returned to the Black Talon while it was still in one piece. The quartet did so just in time to escape from massive Republic reinforcements. Flush with her successes, Iris returned to Dromund Kaas . Back then, it was the capital world of the Empire. To her dismay, she learned that a Dark Council member had heavily involved himself in Imperial Intelligence affairs. Worse, this Darth Jadus wanted to see her personally. A personal audience with a Darth was terrifying and quite potentially fatal experience. Yet it actually turned out well. Darth Jadus knew that many IIS agents and handlers secretly had a poor opinion of the Dark Council. Therefore, he had picked Kalder as a young up-and-coming agent who was less likely to have developed such an attitude. This was ironic. Especially since despite Jadus’ typical Dark And Ominous Sith Dramatic Pronouncements™, it became obvious that he couldn’t *actually* read Iris’ mind as he implied he could. This was an epiphany for the secretly rebellious Kalder. Jadus was extremely powerful in the Force. If he couldn’t read minds, none of the Darths presumably could. She also perceived that Darth Jadus’ secret agenda wasn’t quite aligned with the rest of the Dark Council’s either. This made working for him… interesting. Jadus further implied that he was looking for some sort of mole within Imperial Intelligence. Between these two implicit goals and Darth Jadus’ enormous personal and political power, he was certainly an elevator Iris could ride to further her own hidden agenda and influence. One of the first missions Darth Jadus assigned Iris to was just her speed. Agent Kalder was to cripple the power base of Lord Garthan. Garthan was a renegade Sith with delusions of grandeur, a private army, a vast fortune – and crazed projects about super-weapons and enhanced soldiers. The Dark Council had declared him persona non grata. But the Imperial military couldn’t quite act against the renegade Lord. Like all Humans from the Dump, Ms. Kalder has hollow cheeks and extremely pale skin and hair. This is due to the peculiarities of local lighting and nutrition. She dyes her hair a dirty blonde to avoid drawing attention. The shade was chosen to match her amber eyes. Her skin is so pale that under harsh lighting it looks vein-blue. And stark white lighting is the most common one in Imperial structures. She favours clothing that is tight, practical and dark. With hidden body armour and plenty of pockets. Like most Imperial citizens, she has an English accent. But hers is light – she’s from a remote corner of the Empire. And she’s of course trained to adopt other accents as needed. Iris is a loyal Imperial citizen. She’s convinced of the Empire’s superiority over the corrupt, clambering, incoherent has-been mess that is the Galactic Republic. The Empire is the wave of the future, all sleek and smart and shiny and deadly and united behind the Great Leaders. She is particularly proud of being Imperial Intelligence. She sees IIS as the smartest, most competent, most efficient agency in the galaxy. She strives incessantly to be the perfect Imperial spy – ruthless, brilliant, devious, manipulative, pragmatic, flexible, deadly, highly loyal, efficient (there’s that word again). Her dream is to be the next star agent, the Most Valuable Player of 2I, the Legendary Special Girl the best handlers assign to the most critical missions. Essentially, she’s working to become the Black Widow… and so far it’s looking pretty good. As can be surmised, the redoubtable Imperial Intelligence mental conditioning worked very well on her. But there was a big glitch. The gratuitous murder of her parents at the hand of a wet-behind-the-ears Sith Acolyte terrified Ms. Kalder. This was followed up by IIS conditioning to instil a healthy fear of the Sith and keep everyone in line. However, Iris cannot reconcile this gut-wrenching fear with her self-image as a dauntless master spy and assassin in the making. She is *convinced* that she’s super-hot talent, with a high level of competence and deadliness that will rocket sky-high as she flawlessly prove herself. She sees herself a mix of James Bond, Natalya Romanova and Keyser Söze . How could the soon-to-be wunderkind of Imperial espionage and die-hard patriot be afraid of the Sith ? The solution that emerged was a traditional one – hatred. Kalder has secretly come to consider that most Sith are a cancer weakening the Empire. One that will probably bring its downfall. The Sith mercurial, depraved cruelty and brutal infighting are not efficient. And Iris is convinced that Imperial citizens would be even more loyal without the fear of the bad magic men running amok and killing them with impunity. If the Empire was run in the deft Imperial Intelligence way, rather than the moustache-twirling Dark Council way, everything would be right. Rather than spouting gibberish about the Dark Side and the Sith Code, IIS understands that happy, secure citizens are productive citizens. While they are certainly aware of the advantages of cold brutality, slaughter and psychological warfare, IIS also knows of the virtues of cultivating and supporting unlikely allies, gaining favours, magnanimity, reinforcing the rule of law and business confidence – and other things at odds with the debased policies of the more brutal Sith. As she sees it, the Empire that should be is tough and ruthless… but fair, reliable. Certainly not wasteful and in thrall to a warped, ancient religion. Imperial Intelligence has a certain independence. Thus, Iris is pretty sure that many of her colleagues silently share her views. She also considers that if she’s a great enough spy, she can hide her agenda in full view of the Dark Council. Especially now that she knows they can’t really read minds. As her self-confidence develops and her hatred grows, her agenda of “do things the IIS way and not in the Dark Council way” evolves. It becomes “piss into the Sith’s cheerios at every deniable opportunity”. Quite often Iris will wonder “what would a Sith do ?” and then gleefully do the opposite. As long, of course, as it is efficient. Knowing that her actions in the field (which she then covers up in her reports) would make Darth Whatever rage in the name of Sith theology is a kick. Given the Empire’s policies and her job, Iris doesn’t have anything resembling a friend. Her relationships with others all imply manipulation and hidden wariness. Any warmth and empathy are either an act or sarcasm. She actually likes her handler (only known as “Keeper” – like, apparently, all handlers). She considers him a smart guy, a real patriot and a gentleman. But she keeps it hidden since even a handshake would be out of line. She also likes Kaliyo Djannis. Yet though they feign a form of tough girls friendship, they both know that they are just using each other. They would sacrifice the other for greater personal gain at the drop of a hat. Djannis is clearly a sociopath – everyone from her awful planet might be, really. But seeing her hired by Imperial Intelligence also gave Kalder a better understanding of how far afield an IIS asset could range. A form of comradeship is also appearing as they repeatedly face combat, stress and hardship together. Though they both know they’ll never trust each other, this sort of bond plays by its own rules. And they do share an agenda of rebellion and sticking it to the Man, albeit from very different angles. Familiarity (Imperial military protocols and equipment, Imperial tax code, Basic electronic repairs, Computer power user), Headquarters (Confined – apartment in Kaas City), Rank (Imperial Intelligence agent). Kaliyo Djannis (Low), Nekev Nisrok (Low). Attack Vulnerability (-1CS RV vs. bright lights), Attack Vulnerability (-1CS OV/RV vs. strong smells), Secret Identity (Frequent undercover work). Blaster Carbine [BODY 02, Energy blast: 06, Telescopic vision: 01, R#02]. Blaster Pistol [BODY 02, Energy blast: 05, R#02]. Strictly a backup weapon. Mini-Grenades (x6) [BODY 01, EV 07 (Area of Effect 1 AP), Grenade Drawback]. Flash-bang mini-grenades (x2) [BODY 01, EV 01 (Area of effect 1 AP), Flash: 04 (Area of effect 2 APs), Sensory block (Audial): 05, Note : all Powers are Combined, Grenade drawback, R#03]. Vibro-knife [BODY 06, Claws: 06, R#02]. Cover shields [BODY 03, Force shield: 01, Limitation: Force shield is stationary and needs some physical cover as a base]. TOXIC DARTS LAUNCHER [BODY 02, Acid: 03, Poison touch: 03, Range: 04, Thief (Stealth): 02, Ammo: 03, Limitation: Acid has No Range (used the listed Range instead) but does Continuing Damage, Thief (Stealth) only to muffle the shots]. PASSIVE JAMMER [BODY 01, Obscure: 02, Limitation: Obscure only vs. technological detection]. Small set of basic electronic and computer tools to use her Skills without penalties. See our Star Wars Genre article. 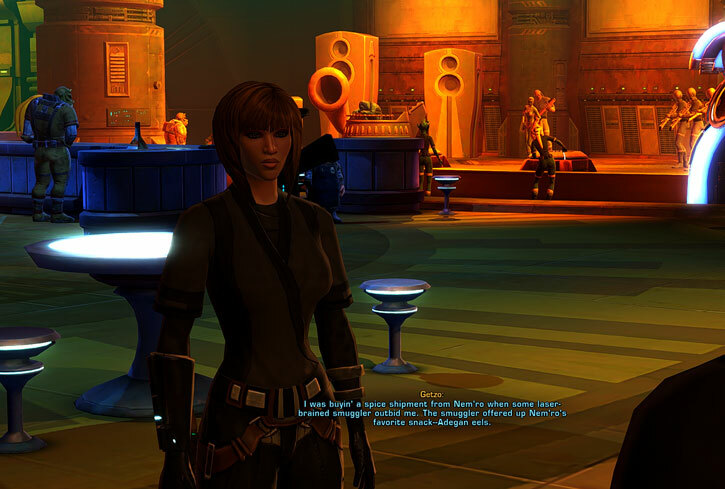 Source of Character: Star Wars: The Old Republic MMORPG. 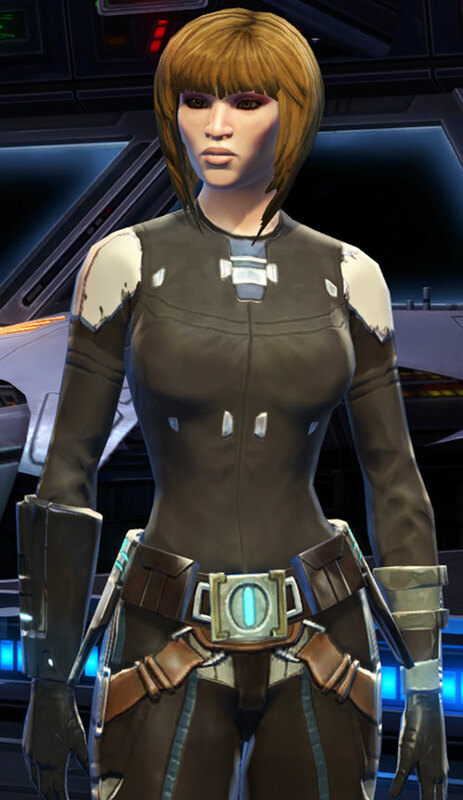 Female Imperial Agent voiced by Jo Wyatt . Writeup completed on the 28th of February, 2016.